Are you an Independent Creative Designer that is going to accept a new assignment and looking for a fresh and visually appealing Designer resume example? We provide a Creative designer resume Template. This Designers' resume design makes it very easy to get notified by the company, among the tons of resumes that they receive for the vacancy that you are applying for. 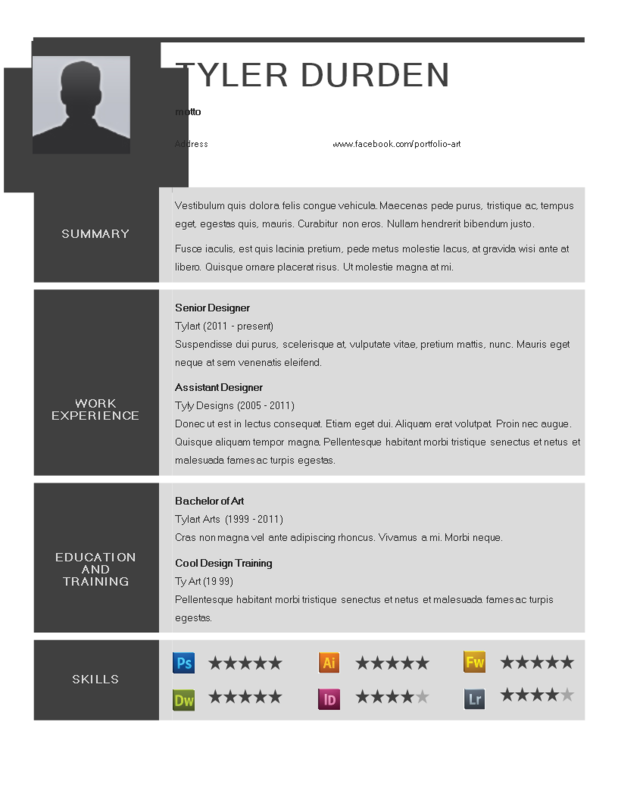 When you are seeking for a new project or employment, and you can allow yourself a more extravagant resume, go ahead with this designer template. A Creatively designed resume is often very artistic, fancy, and visual. The layouts are not very traditional. But this is perfect for someone working in the Creative Designer industry. As all typical resumes, this creative designer resume contains a summary of relevant working experience, education & training, skills and especially Adobe Creative Suite (Photoshop, Illustrator, etc skills). Especially the shadowed dark gray section lines and lighter gray backgrounds add a subtle but creative touch to this resume template. We recommend to hire a professional photographer to make a suitable profile picture for your resume. Also use the star ranking to show your expertise. Public speakers, proposal specialists, and sales managers, creative professional, marketing, and public relations will have an attractive resume with this template. We provide one sample as an MS Word (.DOCX file), which can be easily modified according to your wishes. Our trustworthy senior designer resume templates are crafted and screened by HR and creative industry professionals. After downloading and filling in the blanks, you can customize every detail and appearance of your visually appealing creative resume in minutes! Download our Creative Resume Senior Designer template, fill-In the blanks, print ...done!